My hands down favourite Bible story book for under 5s is The Big Bible Storybook from Scripture Union. It’s theologically really well worded for under 5s, which definitely includes under 3s. We had one when our eldest was 1 and they have both read every story with us many times. There’s also board books, a Bible Timeline and an audio version. So much wonderfulness. 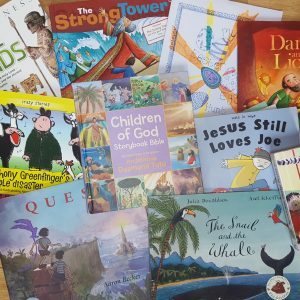 Other Bible storybooks we like include the Children of God Storybook Bible from Collins (50% off when I wrote this post), which is edited by Archbishop Desmond Tutu and each story is illustrated by an African artist. The Strong Tower from SU has a series of Bible stories of children in the Bible in difficult situations. It’s got lovely artwork and is great for chatting about how to deal with, well, difficult situations. The Easter Story – one of a set called My First Bible Stories available from The Book People (12 books for £12) Nice artwork, and fairly well told stories. Don’t expect theological perfection from books this cheap, and not from a Christian publisher as far as I can tell, but you can always edit the bits you don’t like, and we use these to cut up and make puppets to retell and play the story. Bible Lands – Eye Witness series by DK – this is a brilliant book for children to discover more about the content of the Bible stories they know. As you would expect from DK, the quality of the photos is fab. A great way for children who prefer nonfiction to explore the Bible. The Heart and the Bottle by Oliver Jeffers – he’s a fabulous artist and writer. This book is sad and is about loss and grief. The Paper Dolls by Julia Donaldson – a beautiful well written and illustrated book which includes a storyline about loss and new life after bereavement. And also a fab story. The Snail and the Whale by Julia Donaldson (seeing a link here?) – I found God speaking to me through this book and others – its definitely about how my spirit comes to a book, so something which could be encouraged in all books perhaps? Green Eggs and Ham – funny, joy filled book which encourages us to try something instead of deciding we don’t like it first. A good life lesson if not totally in the Bible! I want my hat back by Jon Klassen – a funny story about deception. simple and a great opportunity to chat about taking other people’s things and lying about it! What books would you recommend and why? I love God knows all about me. Our toddler group acts it out as we read it together. Yes! There’s others in the series too isnt there? Thank you so much for the mention. Really glad you like ‘My Easter Egg Hunt’.